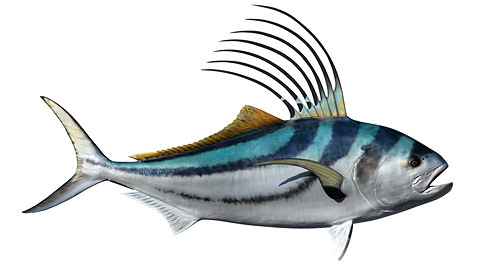 The Rooster Fish (Nemtistius pectorals) is a hard fighting prized trophy fish and is easily identified by the rooster-like comb on its head. This “Mohawk” is actually seven long threadlike dorsal spines that stand erect when the fish feels threatened or excited. This fish is mainly found in Mexico, Costa Rica and Panama and in the eastern Pacific Ocean from Baja California to Peru. The roosterfish has an unusual arrangement of its ears: the swim bladder penetrates the brain through the large foramina and makes contact with the inner ear. It uses its swim bladder to amplify sounds. Rooster fish can reach over 4 feet (1.2 meters) in length and even though the average weight of the fish hooked is about 20 pounds, some can grow to over 100 pounds (45 kg). It is a popular game fish, but like most fish in the jack family (besides the amberjack and California yellowtail) it is not considered a good eating fish.